Have you ever thought why your common cold is not getting cured or why your kids are falling sick more frequently than ever? Instead of rushing to a doctor, you may find your answers at home. 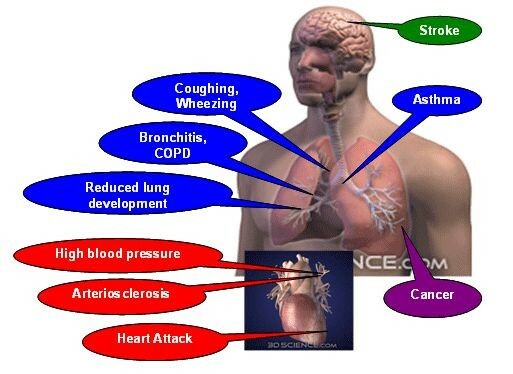 The air we breathe in our homes or offices is more hazardous to our health than the air outside. This is especially true during the cold months when windows and doors are kept tightly shut and homes, schools, and office buildings are made as airtight as possible to conserve heat. According to the World Health Organization, indoor air pollution greatly increases the risk of both chronic obstructive pulmonary disease and acute respiratory infections in children. In developing nations, acute respiratory infection is the primary cause of death among children aged five or under. Health effects from indoor air pollutants may be experienced soon after exposure or, possibly, years later. The health effects may show up after a single exposure or repeated exposures. These include irritation of the eyes, nose, and throat, headaches, dizziness, and fatigue. Such immediate effects are usually short-term and treatable. Sometimes the treatment is simply eliminating the person’s exposure to the source of pollution. Symptoms of some diseases such as asthma, hypersensitivity pneumonitis, and humidifier fever, may also show up soon after exposure to some indoor air pollutants. 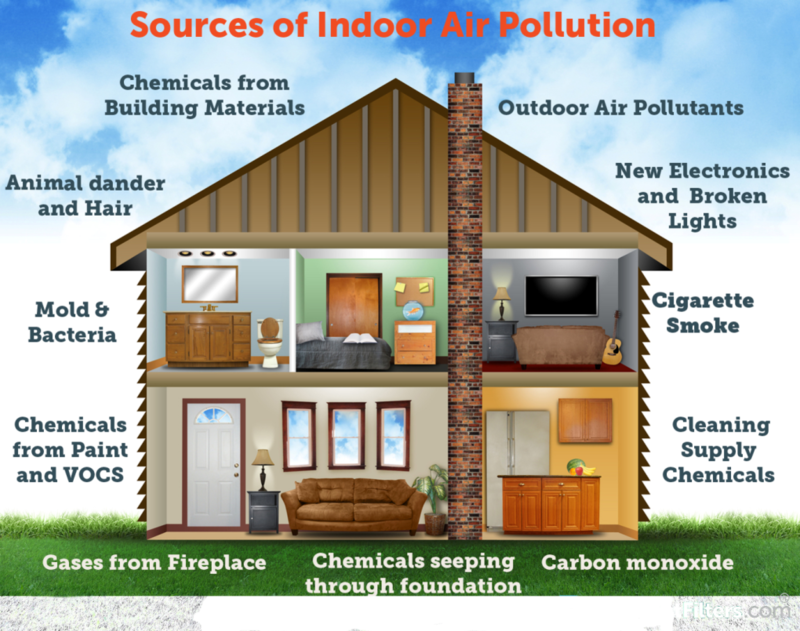 The likelihood of immediate reactions to indoor air pollutants depends on several factors. Age and pre-existing medical conditions are two important influences. In other cases, whether a person reacts to a pollutant depends on individual sensitivity, which varies tremendously from person to person. Other health effects may show up either year after exposure has occurred or only after long or repeated periods of exposure. These effects, which include some respiratory diseases, heart disease, and cancer, can be severely debilitating or fatal. It is prudent to try to improve the indoor air quality at your home even if symptoms are not noticeable. While pollutants commonly found in indoor air are responsible for many harmful effects, there is considerable uncertainty about what concentrations or periods of exposure are necessary to produce specific health problems. 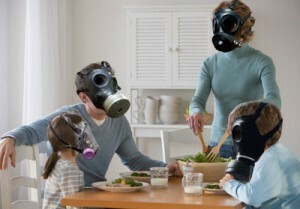 People also react very differently to exposure to indoor air pollutants. Virtually every household and office building is a potential source of excessive amounts of one or another toxic pollutant such as nitrogen dioxide, carbon monoxide, hydrocarbons, formaldehyde, radon (a radioactive product of radium), Sulphur dioxide, asbestos. In addition, chemicals in hairsprays, deodorants, oven cleaners, paints, pesticides, laundry aids, floor and furniture polishes, glue and, ironically, air fresheners also lead to indoor air pollution. Your kitchen range, fireplace, heater, rugs, walls, furniture, clothing, even the sheets you sleep on, can be significant sources of indoor air pollutants. An effective way to reduce indoor air pollution in both developing and developed countries is to provide adequate ventilation. In addition, installing air purifiers can also play an essential role in reducing indoor air pollution. Air purifiers remove the pollutants such as dust, pet hair, cigarette smoke, bacteria, virus and other pollutants that are commonly found in homes and offices. The air purifiers from Kent use an innovative purification technology that removes 99.9% air pollutants such as dust, bacteria, PM 2.5, odor, SPM etc. and breathes freshness into the air.